were discarded, having huge farms to grow food and feeding the hungry. This fantasy sort of fell asleep through the years of ‘growing’ up. saddhu. One of his favorite places was the Mamara Guhai (also called the Mango Tree cave) where Sri Ramana Maharishi had been meditating for over sixÂ years. On one of Nandhi’s pilgrimages, while sleeping in this cave, he was woken up by the Sage who lived in this cave saying,My guru who has not spoken for over 20 years and his other two friends, who too have not spoken for many years have come to our cave. They intend to do a pilgrimage by foot all Â the way to the Himalayas starting tomorrow. You can ask them anything though you will have your reply perhaps written down- if they wish to answer. ThisÂ was like a prayer being answered as for Nandhi did have a big question that needed an answer in the form of guidance. the mind tuned inwards to a meditative space of loud silence. Some of these guiding energies have, later,been incorporated in Nandhi’s teachings of yoga,called Kalangi Yoga. what your heart desires and it will be yours.Nandhi then said, Please give me the wisdom behind all your silence and prayers. After a few minutes of quiet, the sages glowed with smiles. The Sagesaid,Â You have asked us for just what is the only valuable treasure that is worth an entire human life. Come and sit closer and absorb our prayers. 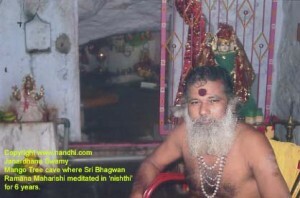 They blessed Nandhi.like to give you our gift- a gift to humanity through you. The ancient intent of all masters of higher consciousness is SAIVAM VETRI. May you be vibrant in this intent of Oneness that upliftsÂ humanity’s collective consciousness!. Saivam means awake to oneness and in literal sense means, a being a vegetarian. Vetri means victory.This blessing woke up Nandhi’s childhood dream.Nandhi began to realize why he was here on Mother Earth and slowly another reality was unfolding. 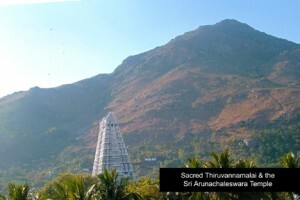 Ammachi:Shortly after the blessings of the three sages of Thiruvannamalai, Ammachi was travelingÂ through Nandhi’s hometown, Sivakasi and she was staying in Nandhi’s parents house. Nandhi’s parents,had a lot to complain to Amma about Nandhi. They told Ammachi, Please put sense into this boy’s Â head. He has forgotten responsibilities. He wanders from one pilgrimage to another. His business has collapsed and instead of being ashamed, he seems happy to spend the little money he has on feedingÂ people. He has become mad. Ammachi smiled and held Nandhi to her lap saying, Son of Siva, just do whatever you do from your heart!. This is Â whenÂ Nandhi told her in a few words, the dream of Amma Sanctuary. Ammachi said, Just do it. Amma is with you. These words of empowerment meant everything toÂ Nandhi. Ammachi’s inspiration has lead the first sanctuary to be called Amma Sanctuary. 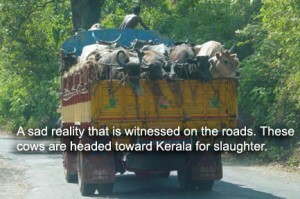 Soon afterwards, Nandhi, found himself in California with each day a little step as foundation towards unfolding the ancient intent ofSaivam Vetri, theÂ goal of creating sanctuaries for retired animals globally, with each sanctuary supporting large organic farms that pledge over 25% of its vegetarian produce to feed the hungry among various otherÂ initiatives such as creating firewood substitute,clean electricity and inputs for international organic farming – organic pesticide and super manure. Why a sanctuary as a spiritual project? Ari is an ancient Tamil word that means to know. Ariven means, the one who is awake. This is the age of higher consciousness with mass awakenings.AfterÂ waking up to realizing we are the spirit having the human experience we are in touch with the reality described in all religious texts, as the I Am. In this realization is the oneness of life, reality,karma and dharma. As awake, we realize the joys of being in the receiving end of grace. In coming together as a community of the awake, we not only enable compassion and sharing on global scales butÂ also lift our civilization to the next level of consciousness. As spiritual beings inspired in the action, we journey beyond the I Am to What If, i.e, transform humanity through our intent as action. How are you choosing the animals for the sanctuary? Imagine making an ox carry heavy load everyday under the hot sun nearly all its life and when old age shows signs, it is sold off. Soon it lands in a slaughterhouse. Likewise, the cows that are milkedÂ until their yield of milk does not justify the food it is given- and sent to a slaughterhouse. Our sanctuary is primarily for animals used by humanityÂ that would otherwise end in slaughterhouses.Our sanctuary will be the little thank you we as human race could express to the selfless animals who haveÂ been milked and whom have toiled for us. We seek assist create the prototype for 200-500 aged animals in our debut project Amma Sanctuary in Stage 1. We learn from this project to create macro sanctuaries to house 5000-15000 aged animals at stage 2. What we seek to do must be on scales torepresent humanity and retired animals everywhere onÂ Planet Earth. global scales through RD, expertise, cooperation and global strategy.